Our complete product line is available to consumers and salons here on our web-boutique. 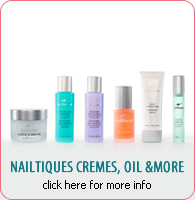 Nailtiques nail and foot care products are specially formulated for a variety of needs and nail types. We value our customers so be assured that all information given on this site is held in the strictest confidence. 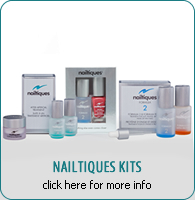 Nailtiques is an innovator in the worldwide nail care industry. Our company is dedicated to the development and maintenance of healthy, natural nails. Since 1990, our success is based upon our unique, salon approved nail care systems. 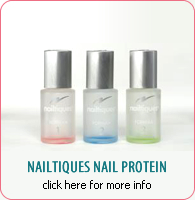 Nailtiques provides six specially formulated protein strengths to address multiple nail problems. Nailtiques crèmes are a vital source for healthy skin and nails. The formulations balance the line for a full range of products for complete nail care.